The Berkeley Art Museum and Pacific Film Archive, affectionately called BAMPFA, is the place to be if you’re looking for a great cup of coffee alongside world-class paintings and film. As the art hub for UC Berkeley, there’s a decidedly academic air to the museum and film archive. This might also be due to the fact that BAMPFA’s new location, which opened in 2016, is a sleek art deco affair found just across the street from the western edge of campus, meaning there might be a lot of collegiate callers coming in after class to clear their minds. It’s the first time the film archive and museum have been under the same roof, and the building is quick to show that. The back half is a dimensional and sheeny metal spacecraft as rectangle that shields the rather large theater, while the front half, where you’ll find the gallery rooms, is stately and refined, like a painting’s frame. The museum itself, although formally established in 1963, has been an important part of UC Berkeley since 1883 when a man named Henry Douglas Bacon donated his library and collection of artworks to the university. Today, the museum is known for its rich collections of Chinese paintings and Japanese prints, as well as artworks from California artists. It is also home to extensive archival material from the Fluxus movement, a radical group of international artists that included artists like Yoko Ono, Bruce Nauman, and Nam June Paik. This makes it one of the best places in the world to study conceptual art, if you’re into that. BAMPFA is also home to the MATRIX Exhibitions, a project started in 1974 to provide a spotlight for contemporary art. In its span of nearly fifty years, it has been home to early exhibitions from Andy Warhol, Jean-Michel Basquiat, and Louise Bourgeois, just to name a few, and has inspired many other museums to adopt similar projects. The film archive was started in 1967 as an extension to the museum and was inspired by the Cinémathèque Française, an extensive Parisian film archive that hosts daily screenings for the public. The goal for the Pacific Film Archive was to be a place where all walks of film viewers, from patrons to students, to artists and critics, could come to enjoy and discuss film. Interestingly, it has the largest collection of Japanese films outside of the namesake country. They also regularly screen classic films and directorial series, such as the complete works of Stanley Kubrick and Ingmar Bergman. If you're a Kubrick fan, you'll love to snap a few pics in the stairwells; they're an all-consuming and lurid red that would not have been out of place on set in 2001: A Space Odyssey or the Shining. With over 24,000 paintings and 20,000 films in their permanent collection, there’s a lot to like here. And don’t forget about that coffee. It’s quite good. "BAMPFA Mission and History." BAMPFA. Accessed January 04, 2019. https://bampfa.org/about/history-mission. "MATRIX." BAMPFA. Accessed January 04, 2019. https://bampfa.org/about/matrix. "Exhibition History." BAMPFA. Accessed January 08, 2019. https://bampfa.org/about/exhibition-film-history. 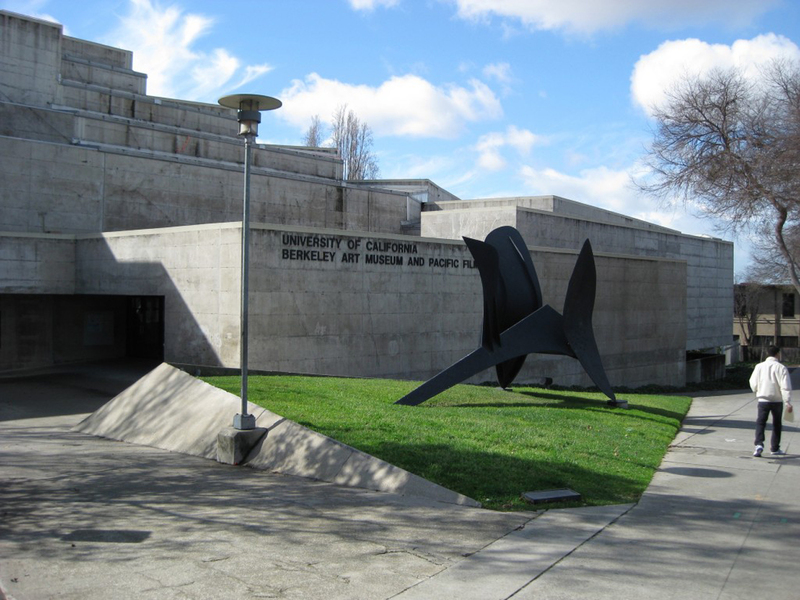 The Berkeley Art Museum and Pacific Film Archive (BAM/PFA) are a combined art museum and repertory movie theater and archive, associated with the University of California, Berkeley. The director is Lawrence Rinder who was appointed in 2008. The building underwent updates beginning in 2009 and which finished in 2015. The archive and art museum moved from its original home to a new location on Center Street; the museum opened to the public in January 2016. Check out the full Wikipedia article about Berkeley Art Museum and Pacific Film Archive.